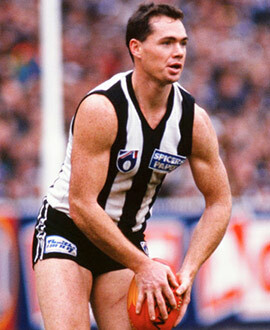 A steady influence on the half back flank across nine seasons, Richardson narrowly missed out on a place as a Collingwood immortal when he was a late withdrawal from the 1990 Grand Final due to injury. Rarely a high possession winner, Richardson was a reliable solider under Leigh Matthews and Tony Shaw for almost a decade, and he later returned to the club to serve as a development coach. Richardson’s football journey began with East Burwood in Melbourne’s Eastern Football League. He received his first shot at the big time when he landed a position with the North Melbourne reserves but he was soon cut loose. Barry Price, his coach at East Burwood, recommended that Collingwood recruit him. He played 18 games in 1990, collecting 20 or more disposals in his first three games of the year. He featured in each of the first three finals before breaking his collarbone in a collision with Essendon’s Adrian Burns in the Semi-Final. With a week off to recover, he was still considered to be in the frame to face the Bombers on Grand Final day. But, sadly, a no-holds-barred fitness test with coach Leigh Matthews in the fading Victoria Park light at the final training session sealed his fate. He was withdrawn from the side, his place taken by Shane Kerrison. He was on the receiving end of a vicious shirtfront from Brisbane’s Michael Voss in his first game of 1996 and played just four more games, returning for a farewell game at Victoria Park alongside Craig Kelly in round 22. Fortunately their teammates did the pair justice, winning by 49 points. Post-football, Richardson coached East Burwood (EFL) and Coburg (VFL) before joining the AFL system with the Western Bulldogs as an assistant. He served as a development manager at Collingwood from 2006-2008, seeing the likes of Dale Thomas, Scott Pendlebury, Ben Reid, Nathan Brown and Sharrod Wellingham through their early years, before moving to Essendon, to Carlton and then Port Adelaide, before finally assuming a senior role at St Kilda ahead of the 2014 season.